It seems as if the world is full of post-rock guitar bands these days. As if Mogwai gave birth to a generation of long-haired boys who take up the guitar and wail about their lives. The thing is, this sort of guitar rock revolution has happened before. Multiple times, probably, but in the early 1970s a different band of lads from the UK did the same thing. I refer, of course, to Black Sabbath, and they gave birth to heavy metal. I suspect that, on some level, Mogwai wanted to be Black Sabbath. In the true spirit of music history, they aren't. Instead, they created something new and exciting that has grabbed the imagination of young lads across the world in a way similar to that in which Black Sabbath grabbed their imaginations. I say all of this because i have come to the conclusion that a post-rock band from Richmond, VA, Graboids, bring the whole thing full circle. 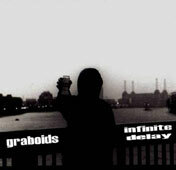 Graboids make post-rock that is heavier on the Rock than the Post. Power chords crunch and drums thunder with a more sinister feel than many of their peers are capable of. Take, for example, the track Looming on the Horizon / Bovien Bliss. Bass arpeggios and delicate guitar echo meander about for a while. The guitars sound almost like something from Hammock here, and the bass is absolutely playful. It all builds and builds, until exploding in a frenzy of chording and cymbals. Ebb, then flow: the standard post-rock guitar band formula. But Graboids' flow is more of a fierce undertow, sucking the listener out to dangerous depths. Similarly, A Certain Ratio of Ducks begins almost ambiently, with e-bow and light guitar effects. It builds to a brief frenzy of head-banging, and then fades out. The ironically titled This Song is Terrible is my favorite on the disc. The slower ebb portion of the song is more Grimble Grumble than anything else -- a hazy psychedelic fever dream with a strange echoed sample wandering in and out. A bad trip, that gets worse when the guitars go into overdrive. It's never fast, but there is a real feeling of danger here. The barely heard sample in This Song is Terrible is the only vocal on the disc, save one. Track 7 is called Top of the Network and is a Graboids song remixed for rap purposes by their friend, British rapper Jeremiah. It is an odd song -- political rap with a British accent and Graboids guitars simmering just under the surface. Since it comes about two-thirds of the way through the disc, it really catches the listener off guard. The first time i listened to the album, i was cleaning my apartment with the CD up loud. When the rap started i got confused, and had to run over to the stereo to see if somehow the CD had changed, and i had some rap promo in next. No, it's just an oddly placed tune on the Graboids CD. Overall, i have to admit to being impressed. This is one of the better post-rock guitar records that i have heard in the past couple of years. Graboids do the fast (flow) part of the post-rock guitar band formula better than pretty much anyone else out there right now. It keeps my attention better than a lot of their peers do these days, and that is saying something indeed.